Cake Smash Milestone Sessions are portraits taken between 11 and 12 months of age. 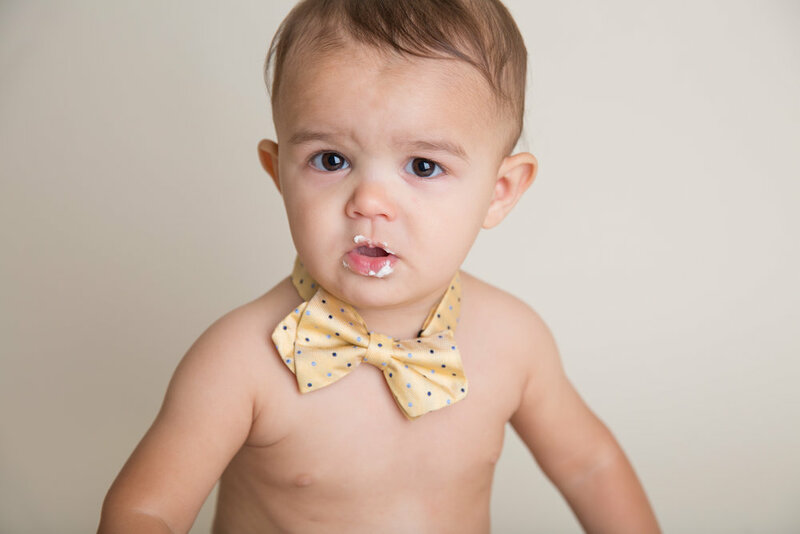 I will create beautiful portraits and adorable images of your soon-to-be 1-year-old having his or her first tastes of cake. This milestone portrait session is the most fun you will will have! 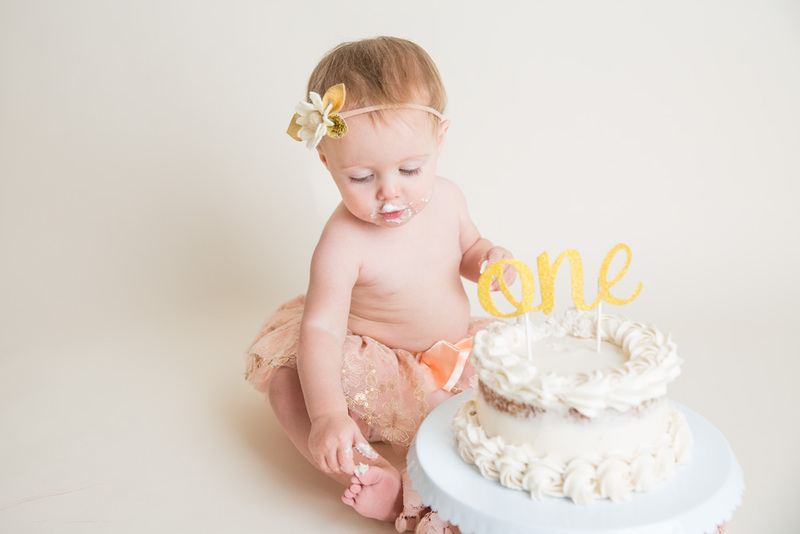 This style of session is one of the most popular and for good reason: you get to see your gorgeous baby destroy a birthday cake. The best time to book this session is when your baby is 11 months old, so you will have these fun birthday portraits returned in time for his or her birthday. I will order a cake from my favorite bakery and I will have the decorations ready. Please let me know if there are dietary restrictions, the cake will be egg and dairy-free, but gluten-free is also an option. I suggest bringing 1-2 outfits plus a clean outfit for the ride home. Please bring a baggie for the messy clothes, lots of wet wipes, small non-messy snacks such as baby puffs, and a sippy cup with water (frosting makes me thirsty!). 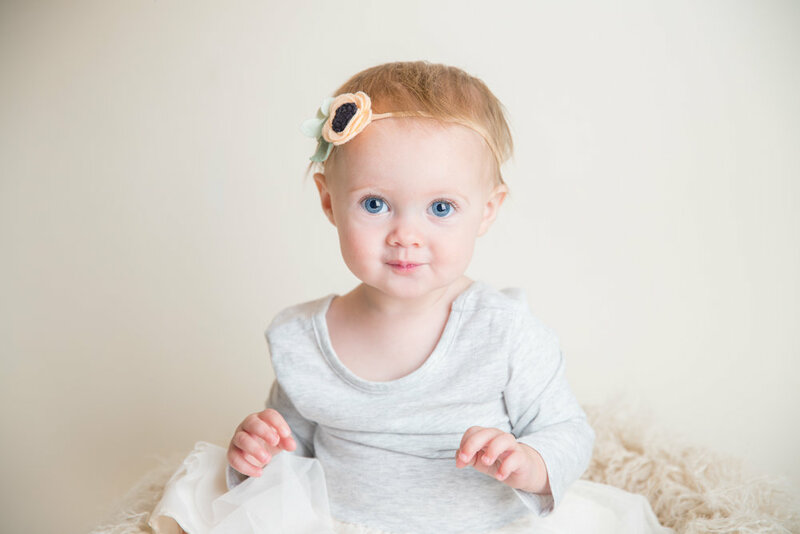 You are welcome and encouraged to bring along any props or items from a newborn session so you can see these items throughout your milestone portraits. A small snuggly toy or special blanket often work well for this. The day of the session you will arrive at your appointment time and we will begin with portraits of your baby with some props in my studio, I have baskets, bowls, and chairs to choose from. Following these beautiful portraits, we will bring out the cake! This will get messy, so please know the clothes you choose for this part of the session will get frosting on them! Some babies dive in face first, some babies only swipe at the frosting, it’s impossible to know how each child will react, but there is always laughter and the cake seems to always end up upside-down. If you’re concerned your little one won’t be interested in the cake, I have a few tricks to gently persuade them, don’t worry. In my studio I have a changing table with all the necessities, a large sink with soap and towels, and even a baby scale if you’d like to do a weigh-in. For the parents, I have a fully stocked fridge for beverages as well as a great selection of organic tea. I can’t wait to meet you and help celebrate your little one’s 1st birthday! Do you have any questions for me? Please send me a message or give me a call! Portrait of blond little boy sitting in a white chair with a big balloon celebrating his first birthday. Image of a first birthday cake with cake topper. Portrait of a little boy licking frosting from his fingers during a first birthday cake smash session. Photo of a one year old girl with frosting on her face during her first birthday cake smash session. 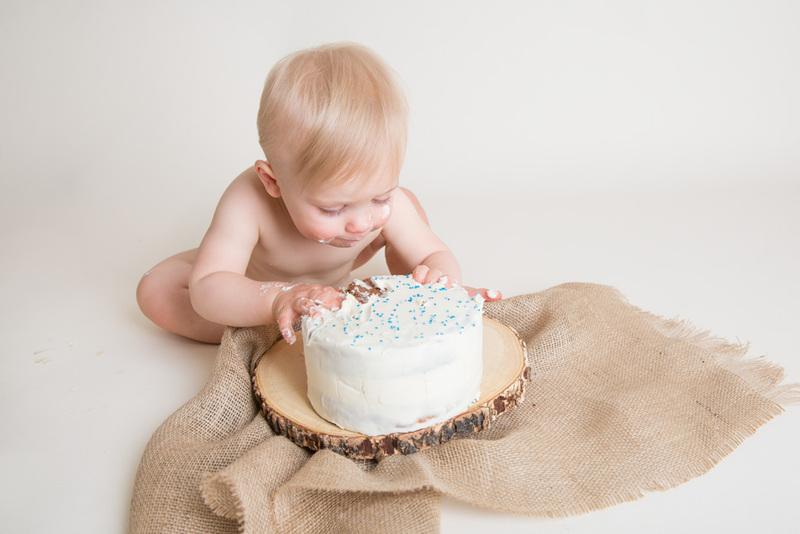 Photo of a one year old boy diving into his first birthday cake. Image of a little girl with cake frosting on her toes during her cake smash session. Little boy shoving cake in his mouth during his first birthday cake smash session. I respect your privacy and won’t share your information, not even with your mother! Thank you very much! You will receive your discount code via email within 24 hours. I can’t wait to capture your next portrait session. Squee! !